Authors love to make up games for their fictional worlds -- but these games are typically unplayable in the real world. Quidditch served as the backdrop for plenty of dramatic action in the Harry Potter books, but it involves flying broomsticks and magic balls. Calvinball provided philosophical fodder in Calvin and Hobbes, but its ever-shifting ruleset makes real-world play confusing at best. But guess what? We've tracked down some bizarre examples of fictional sports performed in the flesh. The full game of Quidditch can't be played in the muggle world, at least not until we get our hands on some broomsticks! The fictional game involves organized teams flying above a modified soccer pitch, pursuing The Golden Snitch whilst avoiding Bludgers and attempting to score with the Quaffle. Confused yet? Clearly you're a muggle. Well, believe it or not, there is a real-world sport based on the fictional game. Called Muggle Quidditch, it's an organized co-ed college sport that's played on soccer fields. The Intercollegiate Quidditch Association includes 105 schools, and was actually profiled in the Wall Street Journal. Muggle Quidditch has some notable differences from the fictional game. For one, the Snitch is played by a human being (typically dressed in yellow) who is allowed to run from the field, pursued by the Seekers on foot (generally the entire school campus is considered fair game for the Snitch). Another rule change involves the Bludger: in some versions of the sport, Bludgers are dodgeballs served with tennis rackets; in others, there's no Bludger at all, and beaters simply tackle other players. 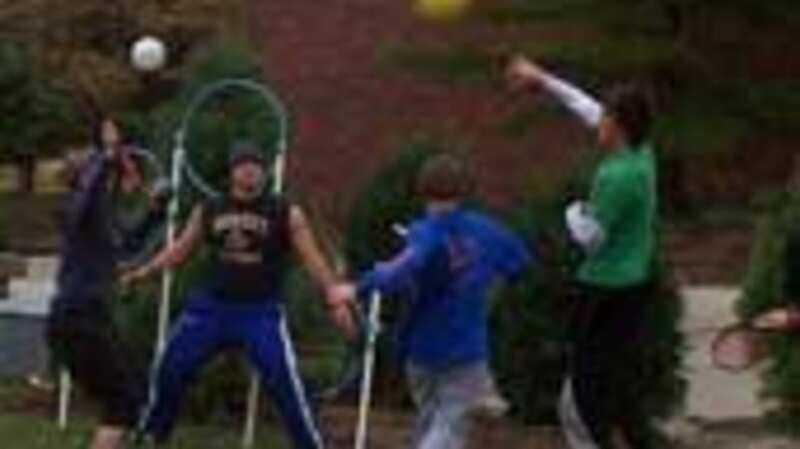 For more on Muggle Quidditch, see the rules on Wikipedia or the WSJ profile. The sport of BASEketball came to national prominence in the 1998 movie of the same name. In the movie, a pair of losers (who also happen to be Trey and Matt from South Park) invent the game as a mashup of baseball and basketball, and enjoy early success...until things quickly get out of hand. (Hilarity ensues.) But BASEketball isn't just a convenient fiction -- it's a real sport that has spawned at least five leagues. According to Wikipedia, film director David Zucker "invented BASEketball years before the movie as a game that everyone could play and held games in his driveway. It became so popular a small league was created. By the fifth season championship game, the event was so big that the city shut down the street and two local Los Angeles TV stations came to report on it." So that was the first league. The web is also rife with other BASEketball leagues. The most fun is a nascent BASEketball League hosted on Tripod. Its home page is remarkable partly for its spelling mistakes, but also for the message from its founder: "I still need a few last players to finish out the 8 teams. Its looking like it will be a 14 game season, with each team playing every team twice. I am working on the scedule the next few days. I need to get available days teams can play from a few people yet. Im looking to start next week. So get ready." Later he writes, "I decided to postpon the league to next year....I will have a day and time decided for when games will be played...until then we will be playing exhibition games." Until then you'll just have to check out the list of teams, league leaders, and the schedule (such as it is). Other leagues include "My League," The Shenangahela BASEketball League (with teams including The Laser Cats and Voltron! ), and the Burlington BASEketball League. (That last one actually seems the most legitimate of all.) While I'm sure there are more leagues, I just had to stop at five. They were getting too awesome. Calvinball was invented by Bill Watterson for his comic strip Calvin and Hobbes. The game itself rebels against organized sports, as Hobbes declares: "No sport is less organized than Calvinball!" Calvinball's rules are arbitrary and constantly changing (in fact, the only stable rule is that the rules must change), scoring is arbitrary and nonsensical (matches may conclude with a score of "oogy to boogy"), and equipment is entirely based on whatever comes to hand. The nature of Calvinball seems to preclude any organization of the sport. But that didn't stop one inventor from proposing a Professional Calvinball League in 2002. The proposal read, in part, "Since there will really be no winners, rankings and rosters are unnecessary." Respondences were mixed, though one pointed out: "Since this is 'Professional' Calvinball, all players are automatically disqualified." Hmm. Although no evidence exists for an organized Calvinball league, there are many instances of people calling for one and even recording their own gameplay, perhaps with an eye towards some future international governing body sanctioning the sport. A Calvinball World Championship was proposed in 2006 on the site Wikimania, and included an amusing Calvinball Disclaimer Form, which asked the "Sucker" signing the form questions such as, "Are you a organ donor?" and "May we steal your wallet/purse prior to the arrival of a[n] ambulance?" For more on Calvinball, check out Wikipedia or the official "rules." 43-Man Squamish was invented in the ninety-fifth issue of MAD Magazine by MAD's "Athletic Council," George Woodbridge and Tom Koch. It was designed to be unplayably complex, but according to Wikipedia, "MAD magazine received so many reprint requests from colleges, it appears that some colleges have attempted to form teams and play the game." Each team consists of one left and one right Inside Grouch, one left and one right Outside Grouch, four Deep Brooders, four Shallow Brooders, five Wicket Men, three Offensive Niblings, four Quarter-Frummerts, two Half-Frummerts, one Full-Frummert, two Overblats, two Underblats, nine Back-Up Finks, two Leapers and a Dummy — for a total of 43. The game officials are a Probate Judge (dressed as a British judge, with wig), a Field Representative (in a Scottish kilt), a Head Cockswain (in long overcoat), and a Baggage Smasher (dressed as a male beachgoer in pre-World War I years). None has any authority after play has begun. Before any game, the Probate Judge must first flip a coin, usually a new Spanish peseta, while the Visiting Captain guesses the toss. If he guesses correctly, the game is cancelled immediately. If not, the Home Team Captain must then decide if he wishes to play offense or defense first. Play begins after a frullip is touched to the flutney and the recitation "My uncle is sick but the highway is green!" is intoned in Spanish. Penalties are applied for infractions such as walling the Pritz, icing on fifth snivel, running with the mob, rushing the season, inability to face facts, and sending the Dummy home early. If you can handle complexity, check out the original 43-Man Squamish rules from 1965, or the (only slightly) more followable Wikipedia explanation. Rule Four: Throw lots of assorted items of sporting equipment over the walls for the players. Anything will do — cricket bats, basecube bats, tennis guns, skis, anything you can get a good swing with. Rule Five: The players should now lay about themselves for all they are worth with whatever they find to hand. Whenever a player scores a 'hit' on another player, he should immediately run away and apologize from a safe distance. Brockian Ultra-Cricket was the inspiration for Tim Astley's slightly more pedestrian Ultra Cricket, an online cricket league which boasts over 550 teams from around the world. Playing in fourteen-week seasons, Ultra Cricket was popularized in the 1990s, when it was played via email. Read this review for some more history. Sadly, Astley's vision of the sport is decidedly more human than Brockian, leaving the formation of a real-world Brockian Ultra-Cricket league in the hands of future generations.